Mister K. had to wander relentlessly before finding the right door. The corridors of the court offices looked like a labyrinth, a perfect representation of the leviathan-like nature of a public administration building. Sweating, bumping into obstacles, he finally makes it to the room where the unforeseeable is about to happen. After all, what could he expect from an appointment he knew nothing about? This scene is a reprise of one of the settings of The Trial (1925), the famous novel by Franz Kafka where a man is accused of crimes he knows nothing about. And that’s how many of us see, or imagine, the State and the public administration these days: confusing, shabby, slow, a bureaucratic juggernaut, the source of entrepreneurial failures you can’t expect anything good from. Kafkaesque, indeed. But what if we were to reverse this paradigm? What if we were to find out that the State has – and has had – a major role in boosting entrepreneurship and technological advancements? Forget about the market vs. public dualism, we’re not here to pick up twentieth-century debates between two extremes. States can be the next generation venture capitalist, if they are committed to innovation and investments. Disbelievers are warned: the case for an entrepreneurial State is already here. Estonia proves the point that a smart State is not a pipe dream. Shaping policies on our tendency to create and to take risks, we have built a startup environment for young entrepreneurs that is now home not to one, but four tech unicorns. Success doesn’t come by chance: it is the result of a convergence between individual courage, collective efforts to make something come to life, and favourable circumstances that are often unique. Assuming that the State has no role in this landscape would mean to deny the crucial role it plays when it comes not only to smooth the edges of market failures, but also to proactively make room for new markets to see the light. the multitouch screen, in its early development, was the result of a University of Delaware research funded by grants of the CIA and the National Science Foundation. No, we’re not trying to declare the death of our tech gods, for the very simple reason that it’s thanks to their vision that we’ve been able to put together all these revolutionary technologies in a single smart device that changed the world. At the same time, disregarding the role that the State had in financing, investing, researching, and taking high risks that the market alone is simply not prone to accept, would not be fair. The Estonian experience represents a call. A call for statesmen, entrepreneurs, venture capitalists, and creative minds, to trust the State too – as Estonia believes in you. We make institutional capitals flow into VC funds to kickstart your projects because the time for old fashioned debates has come to an end: it is the age of foolishness, and it is the age of public-private partnerships. Through the European Investment Fund and Kredex, public money now injects over 200M EUR in the system to bring trust and capitals into private funds and companies. The public started investing in startups in 2008, and some of today’s well-established actors we all know – Cleveron, Monese, Jobbatical, Lingvist, and many more – gained momentum also thanks to that boost. 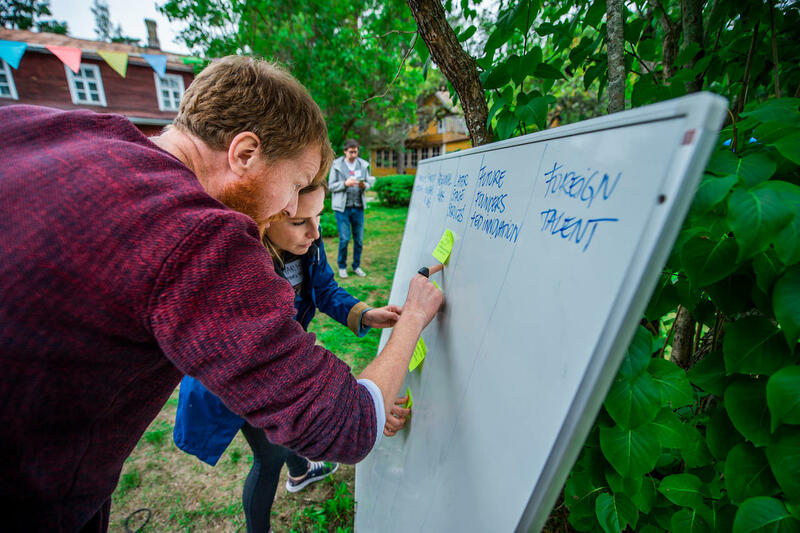 We don’t supercharge the Estonian startup ecosystem for the sake of statistics and macroeconomic data, but because Startup Estonia believes in your ideas and inclusivity, in a scene where everyone matters, and growth is not a privilege for the few. Pitch, create, invest. The State of tomorrow is a State committed to make revolutionary ideas emerge and have a say in a changing world. The extent to which we’ll be able to have an impact on crucial transformations does not rely exclusively on what we can do alone, but also on the partnerships and the connections we manage to establish. We made Estonia the place to make this happen, public and private sectors together. If belongs to the past: let’s talk about when and how.